Survey responses were received from veterinarians in 30 counties across the province with 65% of veterinarians responding that at least 50% of the patients they see are equine. There was a slight increase in the number of uterine infections reported this quarter compared to the first quarter of 2017. Bacterial agents identified included Escherichia coli, Arcanobacterium hippocoleae, and Streptococcus sp. One practice experienced their first issue with Lawsonia intracellularis infection which involved 9 weanlings. Parasite resistance continues to be reported in young stock with both roundworms and strongyles implicated. 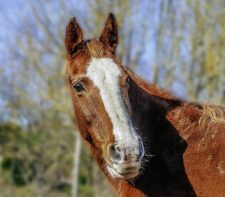 With respect to adult horses, there was a mild increase in the reporting of equine protozoal myelitis (EPM), skin diseases, uveitis (moon blindness) and colic. One clinic noted they had diagnosed multiple horses with gastric (stomach) impactions. Two respondents noted influenza as a cause of upper respiratory tractinfections. Cyathostomiasis (small strongyles) was the cause of diarrhea with low protein in a “well-dewormed” mare and uveitis was noted to develop post-deworming in a weanling. As was typical of previous first quarters, vaccine reactions were commonly noted. When an owner finds an abscess under the jaw there is often immediate panic. Strangles caused by the bacterium Streptococcus equi is a well known and highly contagious disease that causes similar abscesses under the jaw. The concern is well deserved as , with Strangles, infected horses need to be isolated from healthy horses and stringent biosecurity measures adhered to. There’s another bacterium, however, that has been showing up in abscesses under the jaw called Actinomyces denticolens. It affects the same lymph nodes as Strangles but does not cause fever and dullness, and most importantly, is not contagious. At least 5 cases of abscesses under the jaw due to Actinomyces denticolens were identified in Ontario horses in Q1.